Doctor Who fabric features a Time Lord from the planet Gallifrey. The series first aired in November 1963 as a science and history educational TV show. Aliens were introduced to the show a few years later. For tranportation, the Doctor uses a TARDIS which stands for Time and Relative Dimension in Space. Our selection of Dr Who fabric features the Weeping Angels, Silence, Cyberman, the Police Box, the Tardis, Dalek and other characters.These fabrics are great for quilting, crafts, home decor, apparel or anything you desire to create to pass through time. 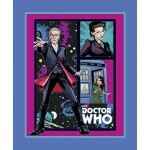 Doctor Who Police Public Call cotton fabric This fabric is from the Springs creative Doctor Who coll.. Doctor Who cotton panel features the comic book character with a space background on half of the pan.. Doctor Who VWorp VWorp cotton fabric features the Tardis tossed against rows of the it's distinctive.. Doctor Who Exterminate Dalek cotton fabric features assorted views of the Dalek Supreme tossed on a .. Doctor Who I am the Doctor fabric features the twelfth Doctor Who played by Peter Capaldi tossed on ..